Meizu Note 9 AnTuTu Benchmarks Appear Ahead of March 6 - Playfuldroid! The Meizu Note 9 will be unveiled on March 6 in Beijing, China. The specifications of the handset have been leaked through its TENAA listing. 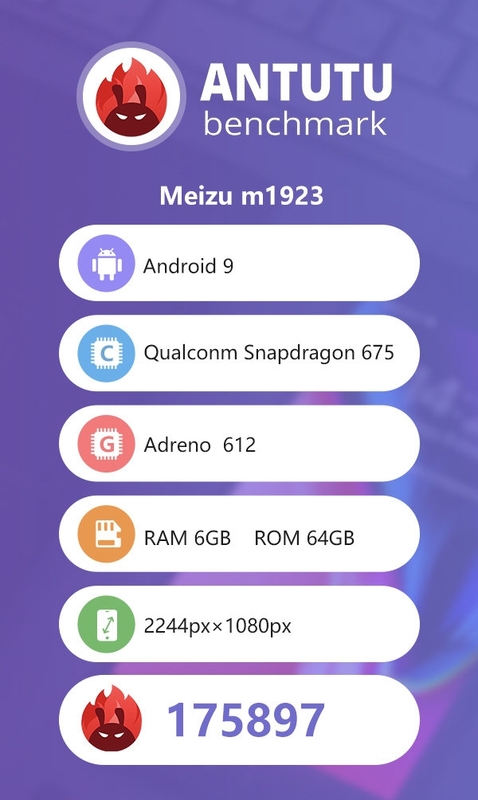 The smartphone has appeared as “Meizu m1923” on AnTuTu today with some key specs and benchmark scores. The Meizu Note 9’s display carries support for full HD+ resolution of 2244 x 1080 pixels. The Android 9 Pie OS comes preinstalled on the device. The Snapdragon 675 mobile platform that includes Adreno 612 graphics powers the smartphone. The SoC is supported by 6 GB of RAM. For storage, the handset is equipped with an inbuilt storage of 64 GB. The handset has recorded an average benchmarking score of 175,897. The Note 9 is equipped with a 6.2-inch screen with waterdrop notch. It receives power from a 4,000mAh battery. Rumors are rife that it will carry support for 18W mCharge rapid charging technology. It will be available only in a single storage option of 64 GB. It won’t be featuring a microSD card slot. The TENAA images of the Note 9 is equipped with a rear-mounted fingerprint reader. The smartphone has a front-facing camera of 20-megapixel. The backside of the phone features a dual camera setup that includes a 48-megapixel Samsung ISOCELL GM1 main sensor that is accompanied by 5-megapixel secondary shooter.